7:13am Heading to the farmers market talking about what many Angelenos talk about as they hop on the freeway, the ever present, ever brutal Los Angeles traffic. However traveling across town is totally worth it. 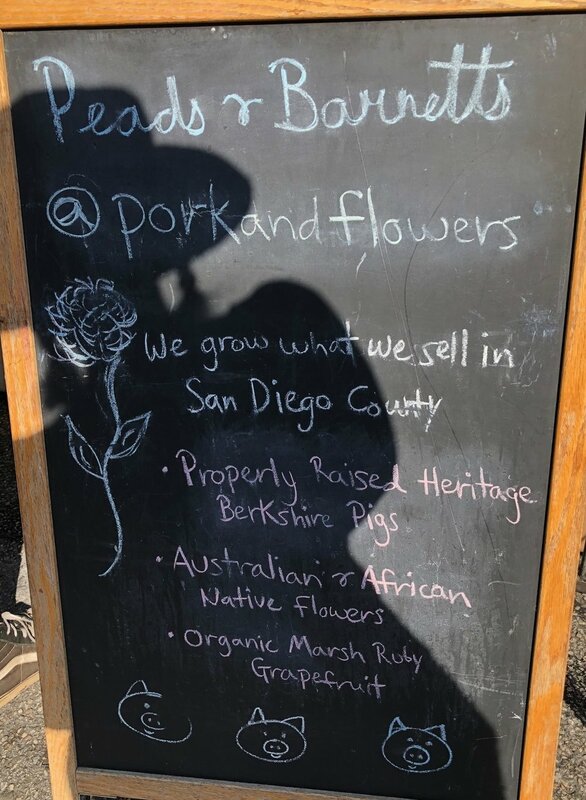 We source a lot of our ingredients from the Hollywood Farmers Market when doing our Sunday Pop Up, but certain events if you are purchasing on Sunday it just won’t be quite as fresh. 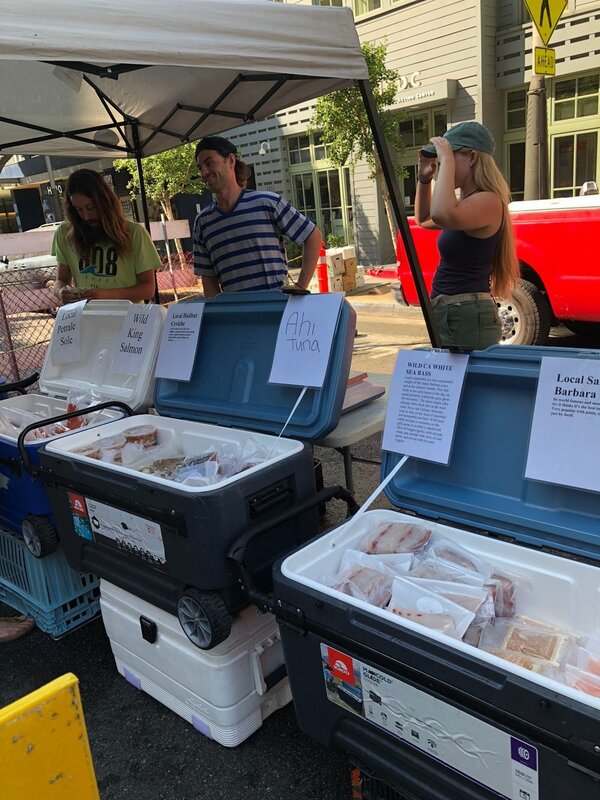 Fresh is key so we make the trek out to SMFM because we want to know who our growers and fishermen and Ranchers and the whole community of farmers market goers are. We start our adventure through the market. The first place that we arrive to is Drake Family Farm for the goat cheese. With several options available we try a couple different styles before coming to the conclusion of which will pair best on the crostini. 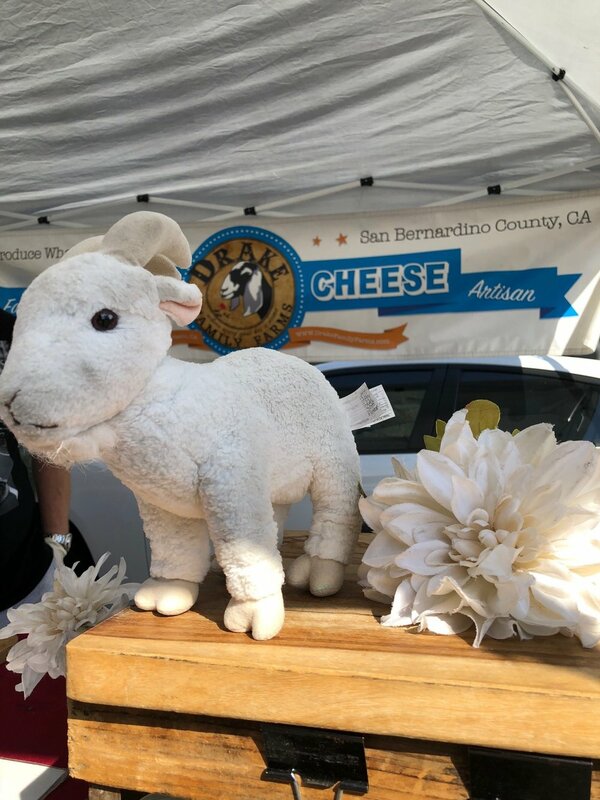 The first sample is the Bloomy Rind Glacier, a goat cheese with an a quality that is almost a cross between Red hawk from Cowgirl Creamery and a traditional Camembert. The second Mt. Baldy, creamy with a oozing layer of meltiness against the blue rind. Then we try the Idyllwild with the flavor and texture composition of a Manchego. While the other two cheeses stand out with the creamy texture mixed with a touch of funk, the saltier Idyllwild takes the cake to be paired with the grilled peaches for our tasting menu. We find ourselves perusing the stall of Fair Hill Farms. The combination of brightly colored fruits and the fresh aroma of sweet summer air is hard to resist. They carry an array of fruit from nectarines and peaches to plums and apples, all that can be hoped for with the start of a balmy August. Trying the white peach then the yellow and for good measure the nectarine and the crunch of apple, we swiftly determine that we really must have a bag of yellow peaches to pair with that salty goat cheese. Then for good measure and to add that sweet tart quality to our fennel apple salad we grab a heaping bag of Granny Smith. 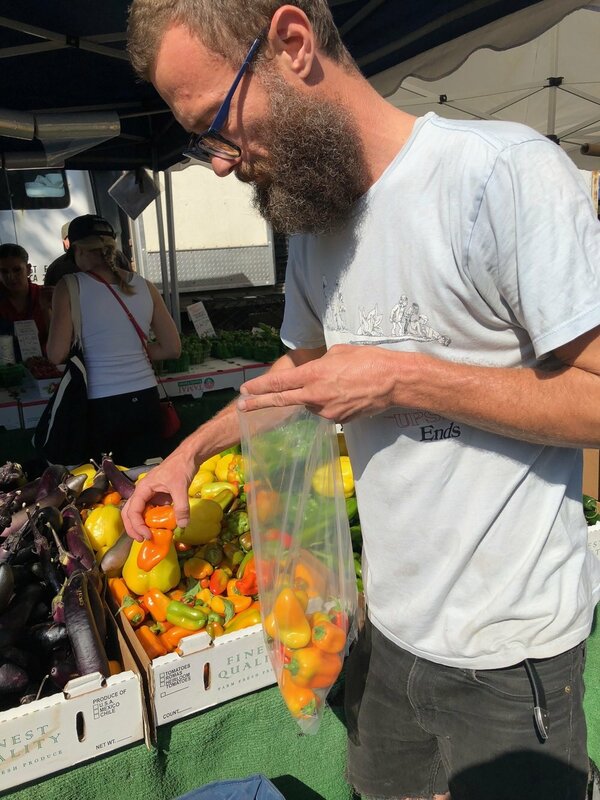 We head over to Tamai Family Farms to grab som tomatoes, corn and sweet peppers Then venture over to Tutti Frutti Farms for a couple of leeks and a butternut squash. To finish up our trip we seek out two local purveyors of proteins. We swing by Peads and Barnett greeted by Oliver and Madison to pick up our weekly pork belly. Oliver uses English Berkshire pigs exclusively because of their high marbling and he leaves the rib meat attached to the belly for extra meatiness. This belly will be cured and smoked and enjoyed by the masses. Last stop for our locally caught seafood directly fresh from the boat Wild Local Seafood. We grab some fresh ahi tuna for one of our starter courses and then for a bonus we get sea urchin for family meal and a full sea bass head for some fish stock. Now…back to the kitchen.